I’ve been away for a long time and judging by the hundreds of emails that have poured in you want me back in a big way. I know it baby, I know. I flew home from JFK last night, 6.5 hours, and I was on JetBlue so we had DirectTv. I stumbled upon something that left me shocked and saddened. 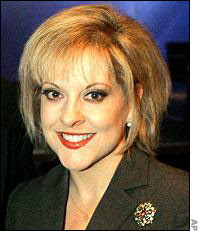 Nancy Grace. Take a look. Now, I realize that freaky looking people make it on TV all the time, but do annoying freaky looking folks also make it? I mean really, she looks like she would eat a puppy. And then she’d come for you. Just a fair warning guys, watch out.